Wonderpads are washable sanitary pads. Wonderpads are made of thin, absorbent foam surrounded by 100% cotton flannel. A waterproof liner attaches to underwear and holds the pads in place. Everything is washable and reusable. "For me, Wonderpads are useful especially for girls who cannot afford to buy disposable sanitary pads." Across the globe there are many barriers to girls’ education. In Sub-Saharan Africa, 75% of girls will begin elementary school, while only 8% of girls will finish high school. The reasons are many and often synergistic, including the cost of schooling, distance to school, violence experienced at school, gender norms, poor health, early pregnancy, and lack of supplies or education around menstrual hygiene management. Even when girls are not missing school, the expense of sanitary pads is often prohibitive, requiring girls to create their own menstrual pads out of rags, newspaper, or other found materials, with their participation in class hampered by a fear of embarrassment from leaking and staining their clothes. Education increases a girl’s earning potential over her lifetime, benefiting her family, her children and her community. Additionally, educating girls is important to the growth and strength of every nation’s economy and awareness around the effect of proper menstrual hygiene supplies on girl’s school attendance is growing. In June 2018, the President of Kenya, Uhurru Kenyatta, signed a law mandating that the government pay for the cost of sanitary towels. Clearly, girls’ educations are impacted when they don’t have access to reliable menstrual products, hampering their educations and leading to a downward pressure on economies. Girls need a better option. 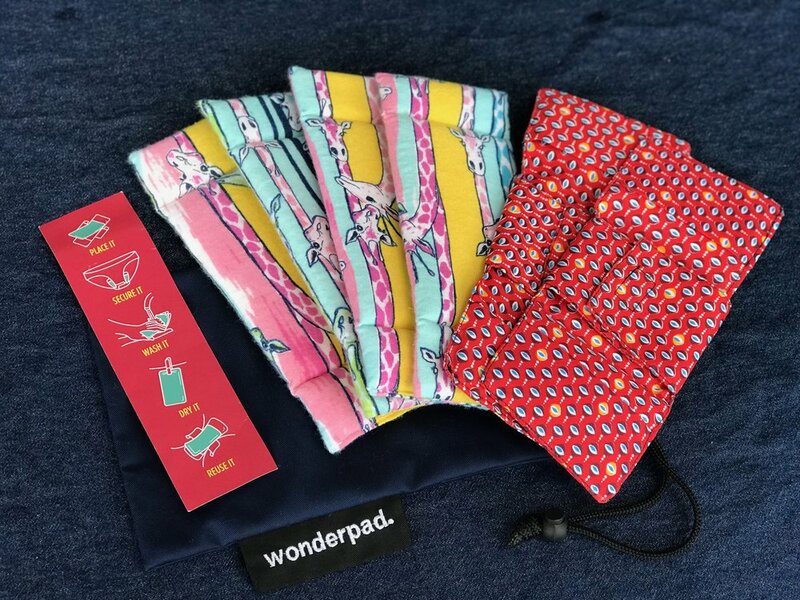 Wonderpads are a reusable sanitary pad, made of a thin, absorbent foam surrounded by 100% cotton flannel. A separate waterproof liner attaches to underwear and holds the pads in place. They are washable and reusable and can last for more than one year if not significantly longer. If you are interested in testing Wonderpads in your community, please contact info @ wonderbag .org. Young women and girls from Kliptown Youth Program are the first to receive the Wonderpads and to share experiences together, led by Nelisiwe Walaza of Kliptown Youth Program, and Lilah P., a student at Mark Day School in California. How would girls store used pads during the school day? Would they require a plastic bag to hygienically transport them home? The average amount of blood lost over the course of a period is 2.4 tablespoons (35 ml), but can range from 1 to 6 tablespoons (80 ml). Pads, therefore, are fairly dry when used over a 4-8 hour period. They could be transported in the carrying bag that comes with the wonderpads. Is disease transmission, especially of HIV, an issue with reusable pads? Human Immunodeficiency Virus (HIV) is a very fragile virus that requires significant quantities of virus direct access to the bloodstream (blood to blood or sexual contact) to transmit from an HIV positive person to an HIV negative person. HIV is highly sensitive to changing environmental conditions, such as aridity, pH, and UV light and starts to degrade immediately when exposed to air. There are no documented cases of successful HIV transmission from casual contact with infected bodily fluids, even when infected fluids contacted cuts, abrasions, or eyes. Do Wonderpads require special detergents to properly clean them? No. Wonderpads can be washed by hand just like any other item of clothing, with any type of detergent or soap. HIV cannot survive in water and degrades when exposed to air and detergent.